If you're tossing and turning all night it could be because you're not using the right pillow. Kris Connell from Real Simple magazine said pillows are very important to getting a good night sleep. "It's more then just comfort, it's also part of your general health," she told The Early Show co-anchor Russ Mitchell. Connell said that if you can fold a pillow in half and it doesn't start to unfold on its own, it is time for a new pillow. She had some tips for finding the perfect pillow for every sleeper. Be aware if you have allergies to material in pillows, which can me made from down, wool, cotton, silk or latex. A good option is a hypoallergenic pillow. If you have sleep apnea, you need a pillow that keeps breathing passages open by lifting the chin. The higher the thread count, the softer the fabric and the more durable the pillow. The standard pillow size is 20 inches by 26 inches. Ask the sales person if you can take the pillow out of the plastic wrap to test the way it feels. Ask the store if they have a comfort guarantee, which says that if you don't like the pillow after trying it for up to a month, you can return it. Pillows by Sleep Better have this guarantee. Pillows can last from two to 20 years, depending on the amount of care they get. They become flat and lifeless when they lose their ability to trap air. The most durable pillows are filled with down and natural feathers, while polyester-filled pillows have a shorter life span. Fluffing your pillow each time you make your bed and placing it in an area where there is fresh air will increase its lifespan. Buy a cover for your pillow to go on before the pillowcase to protect against allergens and dust mites. Give it a hug and see how quickly it refluffs itself. Natural fill is feather, down, or a combination of both. Natural pillows are the best for conforming to your head and neck. They also last longer but are not machine washable. Synthetic pillows, made from polyester, are more affordable. They are also machine washable. 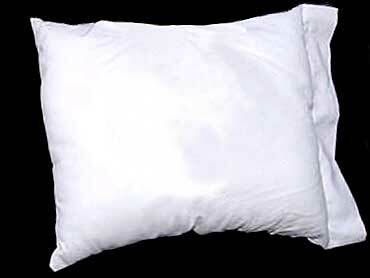 Down pillows are a kind of natural pillow filled with high-quality goose feathers. They are soft, fluffy, scrunchy and breathable. They can be expensive, but last a long time. Real Simple magazine readers preferred the Monaco pillow from Garnet Hill for $98. Testers described it as lofty yet moldable. Synthetic down pillows are made with polyester fibers to simulate down. These pillows mimic the down pillow's ability to flow around the neck and head. The material is hypo-allergenic, which is great for sleepers with allergy problems. Real Simple readers prefer the Beyond Indulgence pillow from Bed, Bath, & Beyond for $60. This pillow has super-fine polyester gel fibers and is very comfortable. Memory foam pillows are sponge-like blocks that mold around your head and neck for extra support. The material was developed by NASA. They tend to be heavy — even sandbag-like —but are the best for sleepers who prefer a firm pillow. The downside is the pillow can make sleepers sweat, but are good options for people who are sound sleepers. The pillow won't form around the head and neck of someone who moves too much. Readers preferred the Gridzone Classic by Select Comfort for $80. This pillow has channels that help air to circulate, which counteracts the pillow's tendency to make sleepers sweat. Combination pillows combine the virtues and offset the flaws of two different materials, such as down or synthetic down and memory foam. Readers preferred the Beyond Perfect pillow by Sleep Better for $70. Its core is memory foam and the outer shell has two different sides: one with a thin layer of synthetic down, the other with a thicker layer for more softness. The back sleeper gets a lot of support for the head, but that position causes breathing problems, which might lead to snoring. People who sleep in this position want a pillow that fully supports their head like the Garnet Hill Density chamber pillow for $48. Its outer chamber is filled with 100 percent goose down, but the sleeper gets extra support from an inner chamber, which is filled with 95 percent goose feathers and 5 percent goose down. Back sleepers need a medium density pillow but can also support their necks with something like a rolled up towel. Pillows between the knees are also good for the back. People who sleep on their stomachs need thinner pillows to keep their heads in alignment. Those with neck injuries or acid reflux problems will find it almost impossible to sleep in this position. Stomach sleepers tend to like firmer and less resilient pillows. Real Simple readers preferred the PrimaLoft stomach-sleeper pillow from Lands End for $39.50. This pillow provides firm, hypoallergenic support but may not be as fluffy and comfortable as a down pillow. The side sleeper needs something that contours and cradles the neck, providing an even sleeping surface. Real Simple readers like Natural Balance pillow from NatureWorks for $30. This fill, a synthetic fiber derived from corn, has a high loft, providing the perfect support for the neck and head. Side sleepers need firmer pillows to keep the body in a horizontal line. A pillow between the knees is good for hip alignment. The body pillow is good for pregnant women and the side sleeper. It provides a cushion underneath stomach. People who like a lot of pillows surrounding them will like a body pillow for the sense of comfort and shelter. The Memory Foam contour shape pillow is good for people with neck or spine issues. The extra support cradles the head and for people who sleep on their back. The contour crescent-shaped cutout supports the head and neck and eliminates shoulder and back strain. The four position pillow works in any position. It is bulky and the sleeper has to mold it to his body. It features two strategically shaped sections hinged together and offers softness and support for the standard sleeping position, inclined sleeping position, partial upright position and full upright position. The U-neck pillow is perfect for traveling and supports the neck.